Keeping secrets is a dangerous game . . . When Sir James Harrison, one the greatest actors of his generation, passes away at the age of ninety-five he leaves behind not just a heartbroken family but also a secret so shocking, so devastating that it could rock the English establishment to its core . . .
Joanna Haslam is an ambitious young journalist, assigned to cover the legendary actor’s funeral. The great and the good of the celebrity world are there. But Joanna stumbles on something dark beneath the glamour: the mention of a letter James Harrison has left behind, the contents of which others have been desperate to conceal for over seventy years. As she peels back the veil of lies that has shrouded the secret, she realizes that there are other forces attempting to prevent her from discovering the truth. And they’ll stop at nothing to reach the letter before she does. The Love Letter is a thrilling novel full of secrets, lies and unforgettable twists. from the internationally bestselling author, Lucinda Riley. The Love Letter is a truly multi-faceted story… there is mystery, action, espionage, romance and menace… A dangerous game of cat-and-mouse through lies and love, secrets and subterfuge, deception and danger. An intriguing change of direction from one of our best-loved authors. 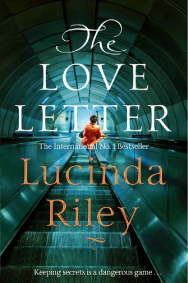 Lucinda Riley never ceases to amaze me in her writing… The Love Letter is a suspenseful read, with some unforgettable characters, and a plot line that grabs your attention; I genuinely couldn’t put it down.